Consumers today are enthralled by mobile apps. In fact, according to comScore 52 percent of consumers' time on their mobile devices is spent in apps. Fiksu, a provider of mobile marketing technologies, has released the latest figures detailing mobile app downloads for the month of January 2015. 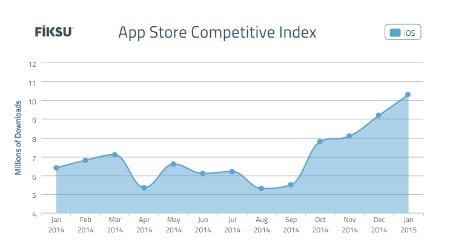 According to the Fiksu App Store Competitive Index, which tracks the aggregate daily download volume of the top 200 free iOS apps, the daily app download volume jumped to a record 10.3 million, easily knocking the previous record from December 2014 (9.2 million) from the top spot. Fiksu also reported that grew 12 percent month-over-month as well as a staggering 61 percent since January 2014 (6.4 million). Other indexes that Fiksu has released include Cost per Loyal User Index and Cost per Install Index. "As we smash yet another milestone with 10.3M daily app downloads in January, it's obvious that the consumer appetite for apps has never been fiercer," said Micah Adler, CEO of Fiksu. "But long term success for apps requires marketers to put data to work so they can target and acquire the most valuable users. While that does mean higher costs per user acquired, long-term results are significantly improved by bringing in users who are more likely to become ROI-positive."